What are the big issues affecting training in the industry? With 2017 well and truly underway, we all want it to be a success for our businesses. One way to help guarantee this is to make sure all staff are well versed in their job. Training is key to this, whether that is giving employees the skills to succeed in the first place or just to keep their knowledge and know how fresh. Chris Peat finds out what some of the most pressing issues are in the world of bus and coach training today. Derek said what else could make a last minute rush worse would be that there are less companies involved with it. ‘Half of the people once doing DCPC are no longer doing it now. If you go onto the JAUPT website and see what approved courses are around your area, you will find there are very few compared to a few years ago.’ One of the reasons for this is much more paperwork is now involved in gaining JAUPT approval, making it harder to achieve. Derek says it does not have to be such a panic though. He suggests operators ensure their drivers go through a training day once a year, every year, so they do not have to sit them through the courses all in one go ‘in a panic’ right near the deadline. There are those that do train regularly, with Derek highlighting many of the operators that are members of such trade organisations as CPT often doing so. With DCPC, a trend he noticed was veteran drivers giving up the job when the training requirement was introduced. However, he has observed that some of them are now starting to come back and do the training. Courses that prove popular are First Aid and Drivers’ Hours, ‘saving people’s lives and your pocket’. Customer care is a common one too. Derek highlighted that some customers may have used another provider previously but, unimpressed with them, now use Novadata. 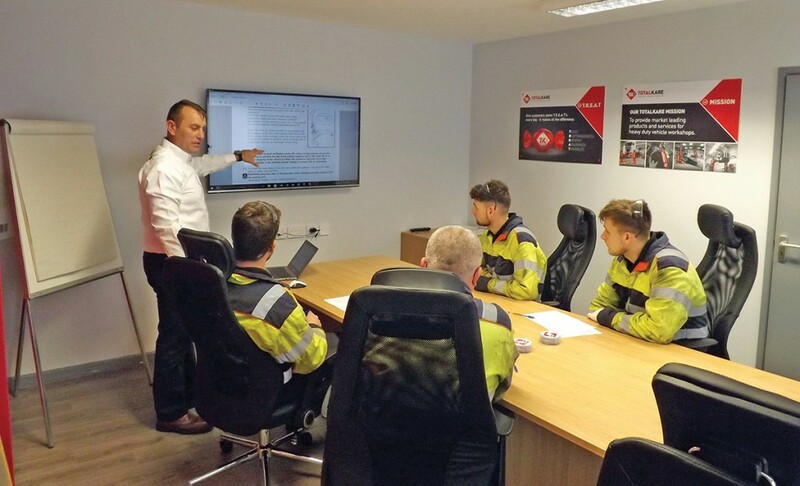 Delivery and content of the courses is ‘really important’ and what helps the company get it right is the fact it was delivering training well before the introduction of DCPC. The company was founded in 1981, so has plenty of experience. Alec Horner from Minimise your Risk. He believes it will be the smaller independents that will have the greatest requirement for training as the deadline approaches, with the bigger companies tending to be more up to date. One change he sees with this is that as the older drivers start to retire there will be a change, as the newer DQC holders have differing expiry dates, meaning deadlines for completing the mandatory training will be staggered. Affectively, this may mean training will be carried out more regularly, rather than the current ‘stop-start’ habit of booking training near the deadline. This change in the training cycle is a good thing, he believes. When it comes to DQCs, Alec notes there is an issue with when the cards are issued. He completed his 35 hours of mandatory training last December and found out that he will not be issued his new card until December 2018. New cards are now to be sent out on the anniversary of the date of completing the training in the year the card is due to expire. ‘That is a very complicated concept’, Alec claims. It makes the checking of records more difficult and could lead to confusion over whether a driver has completed their quota of training. Another training issue Alec noted was that there is going to be mandatory training for staff under the Passenger Rights act. The upcoming requirement is to take the form of DDA awareness training and operators are going to have a legal requirement to prove they are giving drivers suitable training. One good way to provide this is to ensure all drivers have seen the ‘One in Four People’ mental illness awareness training DVD for PCV drivers. Making sure training is varied is important, Alec notes, avoiding the comment from drivers of: ‘We’ve done this before!’ There are courses out there that offer something different, he says, a good one being vehicle evacuation procedures, which includes time in the classroom along with time on a bus with a disco smoke machine and role playing. Karen explained that as interest in doing DCPC courses waned after the first deadline, overheads became an issue for some trainers as they do not go down to match falling trainee numbers. Brexit has not helped either, she claims, saying there are people out there that think the need to do DCPC is going to go. Also reducing the industry’s hunger for training is that the transport sector in general is ‘struggling’, she considered. Friendberry’s main work comes from its Operator CPC courses, which are its biggest seller. It has been offering these since 1981 and has written study material for the training. 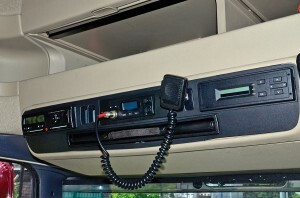 It works across the PCV and haulage sectors. One thing she has noticed in the industry is Traffic Commissioners are encouraging Transport Managers to carry out refresher training courses. Pauline is critical of some instructors in the industry, in particular of the fact they may have plenty of experience in driving but no qualifications in instructing. The experience is good, but she is concerned they have limited training technique. She has found this sort of thing is quite prevalent, particularly amongst in-house trainers. Training makes a ‘big impact’ on drivers, Pauline says, giving them the knowledge they require and ‘making them understand it is their own behaviour that can sometimes cause a negative image.’ She gave the advice that operators should look at who they are using for training and what types of courses they are putting on to ensure the content is relevant. John Pepperell of Phoenix Training said there are a lot of independent drivers who believe DCPC will just go away when we come out of the EU. Because of that, they are not interested at present in doing it, but John finds there are a lot of people coming back to the industry who are ‘desperate’ to get their qualification. He does believe there will be a last minute rush to complete the training when the deadline approaches in 2019. He notes that even firms that planned to do one day’s training a year are now deciding to do it in one hit instead believing drivers are being snatched up by other operators after doing annual training. The only organisation sticking to a programme is local government, he claims. On the subject of Brexit, John said, ‘What’s going to happen when we leave the EU? Nothing. It is the most valuable cargo that the industry is carrying, so safety and professionalism are seen as important.’ He also claims DCPC produces some serious revenue for the Government. He has found a lot of training companies are putting learners through part 1 and 2 of their licence, but the driver then finds they cannot work because they do not have their DCPC. This is when they call Phoenix. A lot of them are ex-military, he says, where they acquire their licence but have no need for a DCPC. An upsurge in trainees from the bus and coach sector has been seen by Chris Shelford of Ridgeway Training. Although he is unsure of why this is, it is certainly surprising to him, as he originally believed the country’s decision to leave the EU would put a hold on operators doing DCPC courses, thinking Brexit would cast doubt over whether the need for it would remain. Instead he finds companies are ‘grabbing the bull by its horns’ and carrying on working towards it. He said the industry and the government has invested too much money into the training scheme to just abandon it. In Chris’s experience, the take up of DCPC has been good, with operators being proactive in his area (Sussex, Surrey and Kent). He says he has been ‘trickle feeding’ them the courses, saying this is the case not only for bus and coach but haulage companies too. Why is this? He believes it is because the customers will realise the effect if they are not keeping up to date with their training. A recently designed course for working with vulnerable people is proving popular for Ridgeway, as is First Aid training and a PSV driver’s day course, which takes learners through all aspects of a driver’s requirements and activities throughout their working day. ‘At the moment, the people we’re seeing coming through our courses are of a good calibre,’ Chris said. Future developments for the company include working with FORS, the transport accreditation scheme. It is supporting them to be more attractive and relevant to passenger carrying operations. With a growing customer base is East Yorkshire Motor Services’ (EYMS’s) training division, which not only trains its own staff but third parties’ too. One key area that has seen particular growth is its Transport Manager award, where it recently revealed that passes had been achieved by all delegates that have taken it. Learners have come ‘far and wide’ to do this course. Training Manager, Darren Kendrew, mentioned the proposals for DDA awareness training previously mentioned by Alec from Minimise your Risk. He said his firm is already doing that. EYMS has recently added four new training buses, specially converted for its needs. For those looking to outsource their training, Darren advised getting a cost effective and beneficial offering from their training provider. 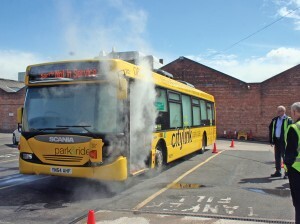 A bus filled with smoke for vehicle evacuation training, seen here at Nottingham City Transport. Another operator with an in-house training department is Nottingham City Transport (NCT). It is headed by Andy Hedgecock and has a team of 22 staff. Andy has been in the position for 15 months and has worked towards implementing changes to the structure of the company’s training division, which he says has made it more flexible. The department covers initial driver training and all induction courses, in addition to DCPC training. It offers this to third parties too. One of the challenges it constantly faces is having to keep up with legislation changes. For instance, Andy said the upcoming Bus Services Bill could cause some issues around this. Another change he will be addressing is the above mentioned one on disability awareness. Another popular course is first aid training. 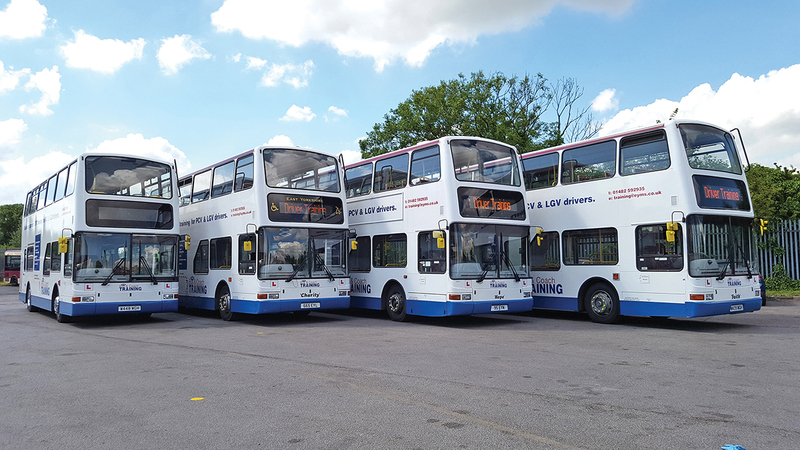 There are changes to technology that need to be kept up with too, Andy stressed, noting that NCT is about to have gas buses enter its fleet that will require some training to operate them optimally. Another challenge NCT will have to contend with is the change to apprenticeships with the introduction of the Apprenticeship Levy. This has required a ‘huge amount of planning’, he said, with a ‘lot of companies not going to be ready in the first year’. NCT has also been involved in the production of a new apprenticeship standard for buses and trains. When it comes to rolling out a training regime, Andy said you have to base decisions around the needs of passengers. As such, good intelligence on what the public thinks about the company is required. NCT carries out ‘hundreds of driver’ observations, in addition to formal assessments of them. Training in the bus and coach sector runs in waves, according to Ruth White of the Wallace School of Transport. Sometimes operators will have a recruitment push, meaning more will come in for training, while some of them have their own instructors. There is always a steady stream of people that want a licence. Ruth says there is a definite character type that thrives in the bus and coach industry and they are those who are people orientated. Some people get their licence and start work, but realise the meeting and greeting of the public is ‘not for them’ and leave the job. Having that personality trait is necessary and it is something she believes cannot really be trained. When it comes to getting driver qualifications, Ruth finds that in general with the initial theory test, most people get through the first or second time. However, when English is the trainee’s second language, then there might be a communication issue that affects their ability to pass. Regarding DCPC, Ruth says the concern for smaller operators is that if they invest in training or their staff, will they then ‘wander off and work for someone else?’ To lighten the burden of training, she advises operators have regular training sessions, perhaps once a year. This proves to be economically better, covering everyone’s training in one go rather than leaving it until the ‘11th hour’, training only when individual driver’s DCPC deadlines near. This will be made more the case as new starters come into the industry with DCPC periodic training deadlines staggered unlike those who were already in the industry prior to the DCPC requirement. 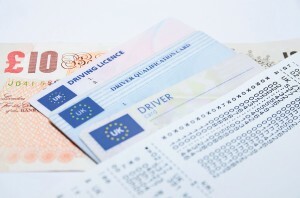 When it comes to whether to pay for drivers’ DCPC training for them or to let them pay themselves, Ruth suggested that if the drivers say ‘no’, then the operator will have to pay regardless or lose their drivers. An issue Ruth highlighted that relates to training is the lack of new starters to the industry. One of the reasons, she believes, is that there is no gradual progression to become a bus driver, whereas in the distant past, employees were often put in a conductor role and then worked their way up to being a driver. This is no more the case and she believes taking on apprentices could be a positive move for operators. Dominic finds the ‘more compliant’ companies see that it makes sense to do seven hours a year of training. He says those who have done the 35 hours in one block have found the messages in the course have not fully got through. Doing less more often, he claims, helps them learn and absorb the training. When it comes to rolling out a training regime, Dominic suggests operators look at the key issues it has across the business. They should then find the right education solutions to meet their need. With DCPC, he said it is easy to merely ‘tick a box’, but it would be far better if it helps alleviate any problems the operation has. DCPC is the big issue in training at the moment according to Nicola Dugdale of Specialist Training, specifically the fact that ‘operators are not doing it at the moment’. She considered people tend to be leaving it much later, particularly as employers do not want to pay to put their staff through courses and then have them subsequently go work for someone else. As many here have already suggested, Nicola believes operators should be organising one seven hour DCPC training session per year. She claims it is a good way to ‘get in the pattern of training’, as well as to eliminate any ‘anomalies’ caused by different expiry dates on DQCs. Putting drivers all through one block of training means operators only have to think about it once, ‘rather than having that nagging thought of training at the back of their mind’. Cost is an issue in training, according to Nicola, which she says is the case across many things in the industry. In rolling out a training regime, Nicola said analysis of what exactly the operation needs is required. It is important to work out what will benefit the company at the bottom line. She says you need to look at any existing issues and determine how employees can help. Specialist Training can help in this by offering bespoke courses, designed in line with current issues each of its customers has. Nicola said it is not only drivers that Specialist Training offers courses for. It also provides training to keep operations staff and managers up to date with legislation and regulations. She notes Traffic Commissioners are now particularly focused on keeping people in these roles aware of the information they need to know. Some operators approach the company for this by request of Traffic Commissioners, while others come on their own volition. How fast you can pass someone through their driver training is something a lot of operators are looking for at the moment, according to Director of Chevron Training, Karen Wharton. However, something that slows the process is the DVLA’s turnaround time for getting licenses sent out. In Karen’s experience at Chevron, more are now starting to make progress towards finishing their required periodic training for DCPC. The number of bus drivers she has seen take up these courses has increased, noting that the start of the New Year has perhaps prompted some to take on this training. She said she is going to increase the number of these courses the company runs per month in line with this demand. This ramp up in periodic training shows there is ‘active interest’, with operators being more proactive. She believes Brexit will have little effect on DCPC, instead believing it could provide a chance for it to be changed to suit requirements. One way she does not envision it altering is by the addition of testing. It would be ‘very difficult’ to implement testing now, she claims, believing it could drive a lot of people out of the industry. How drivers perceive DCPC depends on past experiences with it, how good past courses and trainers were. However, Karen believes a good trainer can turn their perception round. She said she has had drivers tell her at lunch during training sessions, ‘actually, I’ve learnt something’. Perennially proving popular are drivers’ hours and tachograph courses for DCPC, which are ‘by far the most popular from the employer’s point of view’ whilst its course on vulnerable road users is well attended by individual drivers. Her advice to anyone looking to roll out training is to ensure companies let you have a look at what they do and visit their place to make a better assessment. She also suggests being aware of training brokers. GAP Training Director, Garry Geraghty, said one of the big issues in bus and coach training is that there is not enough funding. There is not the money there to train people to be drivers or to help with DCPC costs. He believes this is one of the reasons there is a shortage of drivers. He notes that funding is going towards apprenticeships, something he is not really a supporter of. He claims, ‘Apprenticeships might be good for those coming into the industry,’ but they may not be the best for ‘older guys’ already in the industry. 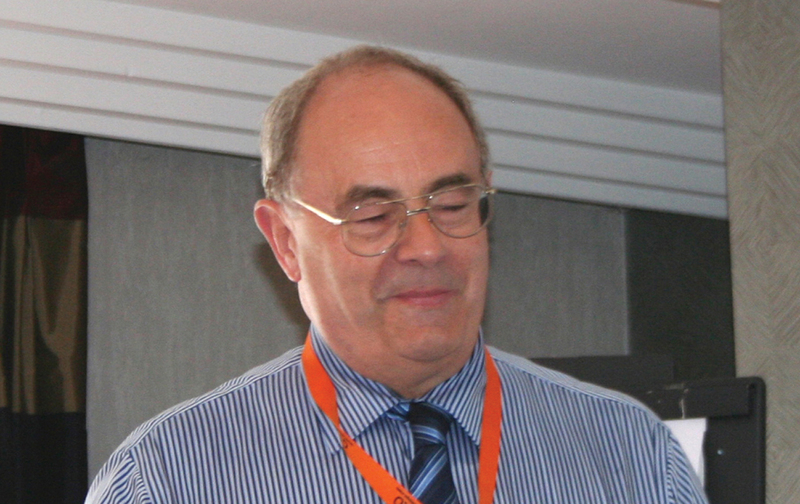 Popular courses Garry provides are on topics that ‘could get them in trouble’, so things like drivers’ hours and tachographs. ‘People are happy to do those time after time’. Although this may be the case, Garry goes to great lengths to ensure courses have different and engaging content. Brian Freeman from Kent based vehicle training provider, Kent Metro, says one of the reasons behind the high quality driver training done by his company is the provision of more ‘one on one’ tuition, or sometimes ‘two on one’. He finds that those who may be good at driving a truck may not be so adept driving a coach and vice versa. It is harder to drive a bus than it is a lorry, he said, noting one of the main reasons being it is carrying people, so driving needs to be smoother, more considered and controlled. Brian said there are still a lot of Transport Managers that are not aware of current legislation, ‘there are still people out there living in the past’. The reason why is the current state of the work place, he claims, with them not having time to keep up to date due to being buried in administration tasks. A lot of people in the industry understand what they should be doing when it comes to DCPC, but they leave it to the last minute rather than doing it over a five year period, claims Hannah Kerr of RTI Training. She notes the company is also getting a lot of individuals sign up to these courses, many of them getting time off work to do so. 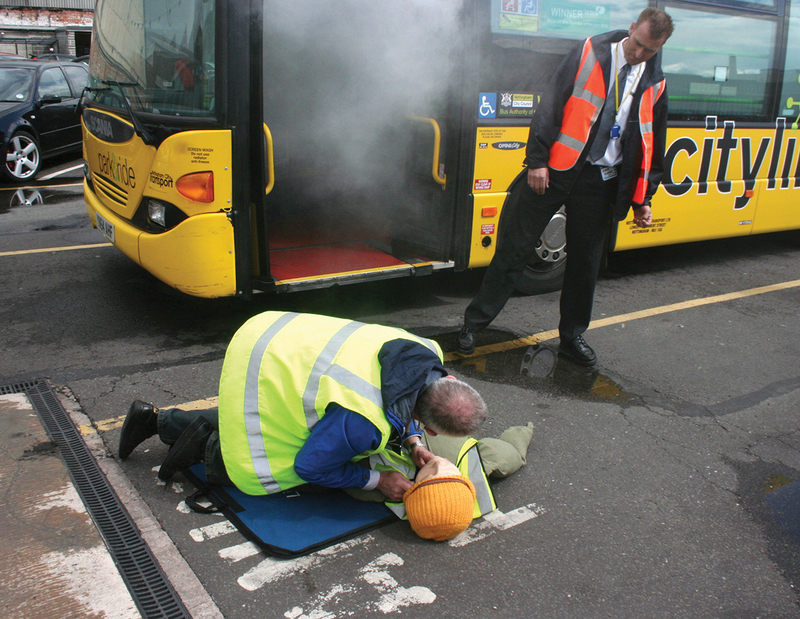 Not only does RTI Training offer training, it also offers a ‘Health check’ for Transport Operator Licensing. The company is made up of professionals in the transport and training industry and only uses trainers who are approved by the relevant examining and accredited bodies. RTI Training Ltd is accredited by JAUPT (Joint Approvals Unit for Periodic Training) as a centre to carry out DCPC courses. Driver CPC courses on drivers’ hours prove popular. 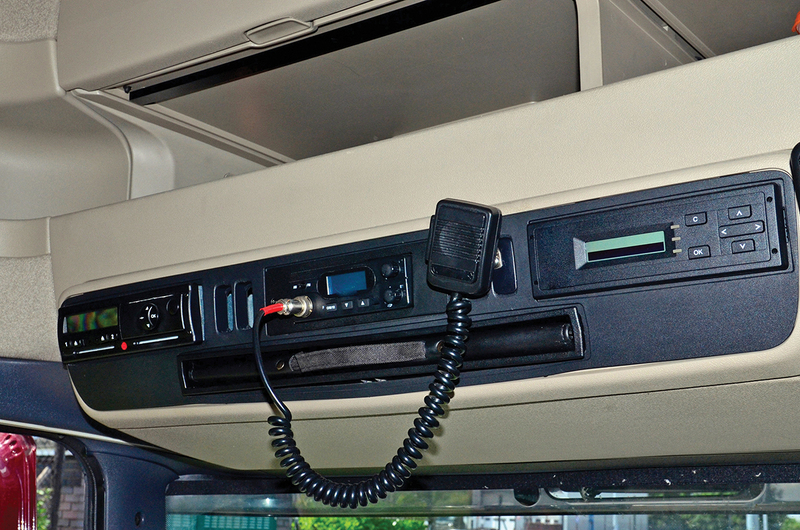 Driver CPC training in tachographs is also being heavily taken up. One of the benefits of DCPC, according to Driver CPC Lancashire’s Derek Kelly, is that in some cases it is the first time the drivers get to hear the rules they must abide by. Previously, for most it was only ‘the boss’ they had heard them from. Derek has found some cases where trainees did not realise the regulations prior to the course. He accepts that when the DCPC was introduced, there was some hostility towards it. However, drivers have now largely come to realise the benefits of it, particularly as it has made them more savvy when it comes to their rights and what is expected of them. One of the most important topics to cover with DCPC, according to Derek, is drivers’ hours, followed by vehicle checking. The next most rolled out is customer service skills. When it comes to how often DCPC training should be rolled out, he also suggests doing it once a year to keep compliant in the eyes of the public. Putting employees through their DCPC or getting staff on a day course is just one area of training in the industry, apprenticeships are another tried and tested aspect. 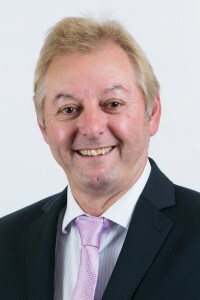 Phil Bannister of GTG Training, which works on apprenticeship schemes, noted that there are new apprentice standards coming up, which he sees as a positive opportunity. Work based assessments will give way to a mentor approved logbook, which is intended to be a monitor of what the trainee is doing. As expected, the apprentice will be supported by the training centre with the same theory taught in college as in past incarnations of the scheme. There will be a ‘gateway’ assessment, then an end one after three years. As well as their capability to do the work, they will be assessed on their behaviour and attitude too. ‘I see it as a positive thing,’ said Phil. There is a lot of need for apprenticeships in an industry with skill shortages, according to Phil. Some of the most popular courses it carries out are for mechanical and electrical professionals and it also does body repair training. When it comes to apprentices, Phil suggested operators focus on making a good choice in who they employ. He suggests having some sort of test for maths and English, as well as a practical assessment in the selection process. Another issue he has with DCPC is that a seven hour session is too long, especially for someone who is used to being on the road all day. He is also concerned by the idea that you can do 35 hours of the exact same course over and over. He suggests operators, instead of booking courses last minute, see what is available and from that what will be of benefit, in order to roll out one training session per year. Totalkare provides mobile column lifts training courses. Of course, training is not just something to be considered for drivers and office staff; there are the engineering employees too. There is training for these available out there, including heavy duty lift provider Totalkare’s mobile column lifts training courses, which are now CPD certified. They are proving popular, according to the company, with a major truck and bus manufacturer allocating over 100 candidates, Cummins Diesel putting some of its employees through it and one of the UK’s biggest deep sea ports, the Port of Tyne, putting 40 members of staff on the course. It is expected that over 1,000 places will be sold this year. It covers safe operation of equipment, pre-use checks and updates on legislation, such as PUWER and LOLER. While the course content is relevant to any mobile column lifts, the functionality section relates specifically to Totalkare’s lifting equipment.